Ready yourself for an expedition of a lifetime offering you a once-in-a-lifetime experience to travel the length and breadth of Australia in style and luxury. 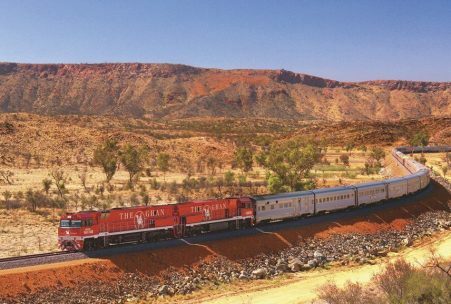 The Ghan Expedition is an epic 4 day, 3 night journey from Darwin to Adelaide will tour you through some of the most remote yet captivating regions of Australia. Scheduled to operate from April to October 2019 and in March 2020 we can schedule this voyage as part of a tailor-made journey around Australia. When planing a trip to Australia then look no further as we are your one-stop travel expert for Australia. Accredited by Tourism Australia we can co-ordinate all the elements of your holiday including flights, stopovers, accommodation, sightseeing and tours from start to finish. Simply contact us for your personalised itinerary. DAY 1: Depart Darwin for Katherine, the gateway to six national parks and over ten nature parks, reserves and conservation areas. Your legendary journey aboard the iconic Ghan begins at Darwin Rail Station where friendly staff will lead you through corridors to your comfortable private cabin. Once in your cabin you can take your time to settle in and familiarise yourself with new surroundings that will be home for the next 4 nights. 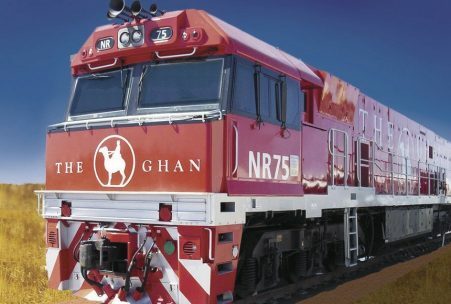 Shortly after boarding the Ghan will smoothly start to move towards an ever changing landscape that you will be able to view through your picture windows. Your first destination is Katherine, Nitmiluk National Park and its spectacular gorge system. Once back on the train enjoy the evening with a fine dinner, fabulous wines and the sun setting. DAY 2: Overnight the Ghan will have travelled on into the Red Centre. will will arrive in Alice Springs fully refreshed after a good nights sleep and a hearty breakfast. At Alice Springs you have the opportunity to embark on one of the included Off Train Excursions, taking in the delights of this famous outback town, to visit the town landmarks, get up close and personal with Australia's incredible fauna and flora or just explore on your own. You have the option to upgrade your excursions with the ultimate outback experience; an scenic fixed wing flight to Uluru, taking in aerial views of Uluru and Kata Tjuta followed by an enjoyable lunch. There is no better way to comprehend the vastness of the Northern Territory. DAY 3: Welcome to Coober Pedy, an underground town in the outback desert, it is genuinely one of Australia's most unusual places. In a bid to avoid the searing heat much of this town has been built underground - homes, cafés and churches. Below the surface you will enjoy a gourmet lunch before heading off to admire the lunar-like landscape that typifies this part of the outback. Once a bedrock of an inland sea this area have eroded over millions of years to a colouful landscape that changes with the light of the day. A photographers delight and a popular backdrop for many movies. DAY 4: Overnight the train continues its journey and in doing so there is a dramatic change in the landscapes as you head towards the south coast and the town of Adelaide. The deep red and ochre colours of the outback make way for the lush green fields, agricultural lands and vineyards of Southern Australia. Your service will end in Adelaide where you will disembark the Ghan with many memories of an incredible journey. Extend your stay by transferring to the Barossa Valley, Kangaroo Island or travel onto Melbourne and Sydney. Australia will fulfil all your travel wishes to conclude a fabulous holiday.